NEW YORK—City Council voted on Oct. 9 to adopt legislation that will make the restaurant health inspection process more collaborative and business-friendly. The set of five bills will increase oversight of health inspections, provide restaurants with educational inspections, and publish details about each inspection online. Restaurant owners have complained of health inspections being arbitrary and adversarial. The new legislation will create an inspector code of conduct that aims to address complaints of some inspectors’ perceived adversarial attitudes. It aims to cut down on what Council Speaker Christine Quinn called the “gotcha” mentality. The legislation will also create an ombudsman office within the Health Department to receive complaints and feedback. It establishes an advisory board of restaurant owners and industry experts to review the food safety inspection program’s effect on restaurants and public health. “Owners never felt that the health department was their partner,” said Noelle Ifshin, a restaurant consultant and president of 4Q Consulting. The legislation will create a consultative inspection process restaurants can request so they can find out what violations they may have and need to address. “If owners, operators, and staff of the establishment understand the underlying thought process of why something is a violation, they are more likely to comply with the regulation,” Ifshin said. According to Velasquez, 80 to 90 percent of food safety violations are the result of management shortcomings. He said managers need to create systems to ensure that staff closely follows best practices for food safety. The challenge of sanitary inspections for restaurants was exacerbated with the advent of the “A,” “B,” and “C,” letter-grading system that began in July 2010. The system led to an increase in inspections, and consequently fines. Many restaurant owners came to see inspections as a revenue-raising scheme. Separately, the administration has also agreed to reduce the fines for violations. “People look at letter grades and equate it with quality of the place,” said Adolfo Perez Alvarez at Meson Sevilla. 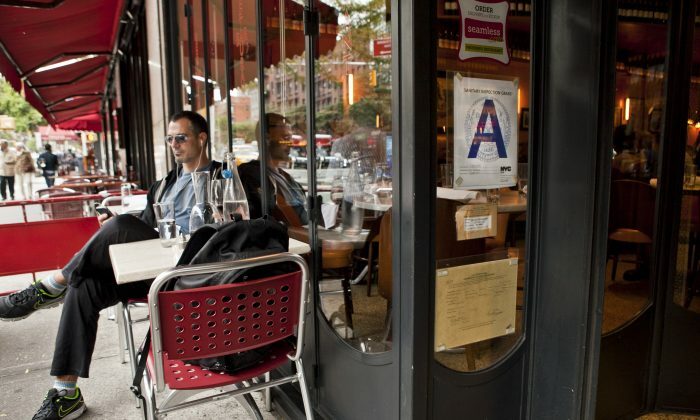 If a restaurant wants customers to keep coming, maintaining an “A” rating has become critical. Perez Alvarez spent four hours on Oct. 9 at an administrative tribunal to resolve a citation for hanging cured meats. The inspector cited him for not refrigerating the meat, which he said state law permits. The citation also included a door that was supposed to self-close, but was affected by recent rain. This was his third time to the tribunal in two months. Cosmetic infractions such as a chip in the counter, or a broken tile in the bathroom that have little to do with the quality and cleanliness of food could cause a restaurant rating to fall to a “B,” Perez Alvarez said. If a restaurant doesn’t get an “A” rating upon first inspection the restaurant can appeal the rating and remedy the violations. But this process can take months. Food safety is of course the reason for inspections, so to downgrade a restaurant from “A” to “B” for non-food safety violations would seem contrary to the goal of the system. According to the Health Department, it looked carefully at which infractions should be counted before rolling out the letter grading system. “Violations that did not directly or indirectly contribute to the potential for food borne illness were excluded as scored violations,” said the Health Department in a statement Oct. 10.